What do Joey Fatone, Napoleon Dynamite, Morris Day and The Time, and the Budweiser Clydesdales all have in common? They will all be part of the First Ever 15th Annual World’s Shortest St. Patrick’s Day Parade on March 17, 2018, in Hot Springs, Arkansas! This year’s tiny parade is so big, it’s going to take TWO days to celebrate it! On Friday, March 16, the O’Kelley’s World’s Largest Inflatable Pop-Up Pub will open at the intersection of Convention Blvd. and Malvern Ave. They will have live music starting at 5pm on Friday. At 7:15pm, Arkansas Songwriter of the Year, Adam Faucett will perform on the Bridge Street Stage, and headliner Grand Funk Railroad will take the stage at 8pm for a free concert. After you’ve spent the night in our Hot Springs, AR bed and breakfast, we’ll serve breakfast at Tiffany’s with an Irish flair to start your St. Patrick’s Day right. Then you might want to sneak back upstairs for a short nap before you head to town for all the fun! The Rebel Stakes is an important race leading up to the Arkansas Derby, as well as the Kentucky Derby. First post time at Oaklawn Racing and Gaming is 1pm on Saturday, so stop to see a few horse races before making your way downtown to Bridge Street. What is Bridge Street? Only the World’s Shortest Street in Everyday Use according to Ripley’s Believe It or Not. It intersects with Central Ave., just a few blocks from Bathhouse Row. On St. Patrick’s Day, this short little street is packed with a whole lot of fun and quirkiness! The parade won’t start until 7:30 pm, but we recommend securing your spot on the parade route much earlier! The Dallas Cowboys Cheerleaders and hula hoop sensation Katie Sunshine will kick off the festivities at 6:30 pm, and the official measuring of the parade route happens at 7:25 pm. Jon Heder, better known as Napoleon Dynamite, will be the official parade starter. Joey Fatone of *NSYNC is this year’s Grand Marshal, and for the first time ever, the Budweiser Clydesdales’ 8-horse hitch and red beer wagon will travel down the parade route! After the parade (which usually lasts about an hour), Morris Day and The Time will perform a free post parade concert at the end of Bridge Street. 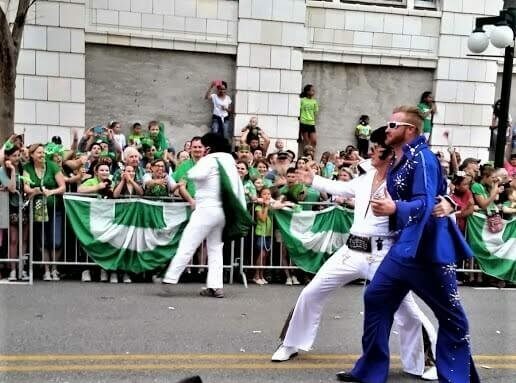 We haven’t even mentioned the pizza king and brewery queen who will preside over the parade, or the World’s Largest Leprechaun, the Irish Elvis impersonators, a dancing dinosaur, roller derby ladies, or the Irish belly dancers! EVERYBODY is Irish in Hot Springs on St. Patrick’s Day!